I normally find myself on the very liberal end of any discussion about freedom of speech – I don’t, for example, think that Liam Stacey should have been prosecuted for his appalling racist trolling about Fabrice Muamba on Twitter, which is not an entirely popular point of view. It’s therefore been interesting to find myself on the other side of the looking glass this week, holding views which are in opposition to a number of people whom I like and respect. The basis of the discussion is an advertisement which was booked to run on a number of London Bus routes by a group called Anglican Mainstream – a deeply conservative, right-wing Christian organisation with links to the US religious right. The ads read “Not Gay! Ex-Gay, Post-Gay and Proud. Get Over It!” – a reference to the group’s claims that they can “cure” gay people and turn them straight, a kind of therapy sometimes (mockingly) called “pray the gay away”. Now, this is obviously pretty offensive stuff. For a start, being gay isn’t an illness, so it doesn’t need a cure – any more than your race, your gender or the colour of your eyes needs a “cure”. Moreover, gay “cure” therapies have been discredited by professional medical bodies and shown to cause serious harm to people who attempt to go through with them. Young people from conservative Christian families are sometimes sent to special camps to “fix” their homosexuality, and the results aren’t happy, well-adjusted heterosexual people – they’re a lifetime of psychological trauma. Even promoting these false ideas about “cures” can seriously hurt vulnerable young people, by making it harder for their families to accept their sexuality. So, there was an outcry on Twitter and other social media sites, and within hours, Transport for London had announced that it had been “made aware” of the campaign and would not be running it. Mayor Boris Johnson seemed to claim credit for the U-turn (he does have an election coming up next month, after all), but TfL’s own statement simply said that the ads had been booked by an external agency and nobody at TfL had seen them until the outcry brought them to their notice. Victory, right? I tend to think so. Others, however, disagree. I’ve seen arguments – from perfectly rational, liberal people, who absolutely abhor the content of these ads – that this is a defeat for freedom of speech, that it’s politically motivated censorship and that it just makes the problem worse, since it suffocates debate over these issues. I understand the arguments, I really do – and I also despise the knee-jerk social media reactions that say, “this offends me! Make it go away!” You don’t have a right not to be offended. That goes for if you’re a Muslim horrified by cartoons of the Prophet Mohammed, a gay person disgusted by homophobic ranting, a US conservative who finds a blog post to be anti-American, or an atheist who doesn’t want to be served by someone wearing a headscarf or a crucifix. All of these people can be offended if they want, but they don’t have a right not to be offended – they don’t have a right to insist that the offending thing be banned. We live in a society of many cultures, religions, views and positions, and many of them will offend you. You have a right not to be damaged by things that are done to you (as in, for example, the case of the gay couple refused entry to a B&B they had booked), but you have no right not to be offended by what people say, what people wear, what they write or what they draw. 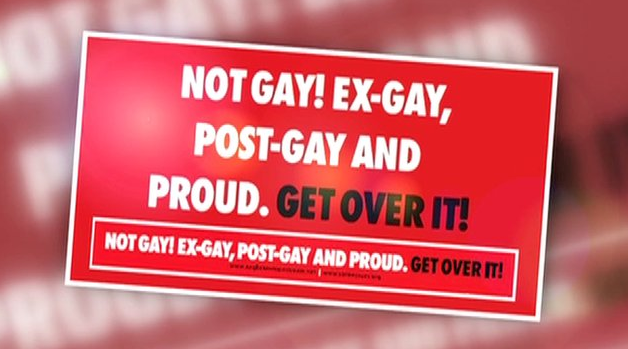 The thing is, I don’t think the issue of the “Ex-Gay” ads is a question of freedom of speech, and I don’t think it’s about a right not to be offended. I think there’s a difference between “freedom of speech” and “privilege of being broadcast”. It’s as simple as this – you’re free to say what you wish, to think what you wish, to express what you wish, but there’s no obligation on anyone else to broadcast that for you. Except it’s not censorship, and it’s not an attack on freedom of speech. Nobody is saying “arrest this person and lock them up for saying such things; gag them and break their fingers, so that they can never say such things again” (well, some people probably are saying that, but they’re an unrepresentative minority whose knees jerk that bit harder than everyone else’s). What they’re actually saying is, “you bear responsibility for what you say, and we’re exercising OUR freedom of expression by reacting to it.” In short – you’re free to say what you like, but you don’t have an inalienable right to a handsomely-paid newspaper column in which to say it. You’re free to say what you like, but nobody is obliged to publish it for you. Coming back to the Anglican Mainstream ads, then – they’re horrible, but if Anglican Mainstream want to put them on signboards in front of their buildings, or distribute leaflets about them, or put them on the Internet, they’re entitled to do so. That’s free expression. If they can find a publication that’ll print them, they’re entitled to do so. I don’t think anyone should be arrested over these ads. I don’t think they should be “banned” by some higher authority with the power to stop things from being said or written or printed in our country. I do, however, think that the transport network of our capital city, used and seen by millions of Londoners each day, has every right to respond to an outcry from its customers and make a sensible decision about which ads to run. TfL has absolutely no obligation to run these ads. If it thinks they’re horrible, or will hurt or offend passengers (to whom TfL does have an obligation), it’s quite right to refuse them. This doesn’t hurt freedom of speech. Anglican Mainstream can speak all they want, and no matter how much it offends me, I absolutely defend their right to do so. But TfL, a body which exists to serve Londoners, doesn’t have to help them to be heard. We all enjoy the right to speak, but the right to be heard or to be listened to is, quite rightly, something that’s a lot harder to earn.